Cherry blossoms in Sendai, Miyagi, Japan. 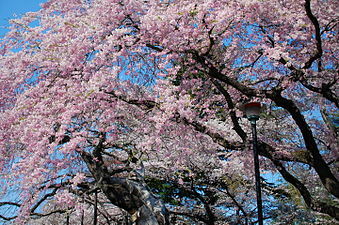 The Japanese language has different words for the pink of cherry blossoms (sakura-iro), and peach blossoms (momo-iro). Recently the word pinku has also become popular. Pink is often associated with the exotic. Greater flamingoes in flight over Pocharam Lake in Andhra Pradesh, India. 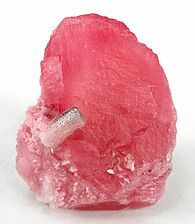 Rhodochrosite is one of the many kinds of pink gemstones. Pink is sometimes associated with extravagance and a wish to be noticed. A 1963 pink Cadillac. Pink and white together symbolize youth, tenderness and innocence.